→Which Roast Beans Make the Best Coffee? A question that I am asked a lot here on my blog is which type of coffee beans are the best? The question that they more likely should ask is which type of roast is the best. Although the bean is of course very important, the actual roast is even more important. The beans come from a number of different countries and as such will all have a slightly different flavour. You can read this article if you want to find out where coffee beans are produced. In that article I also explain how the different climate conditions can impact the flavour of the beans. However it is the length of time that they are roasted for, that actually determines the overall taste and look of our coffee. There are quite a few different roasts once you start to investigate them, and they offer coffee drinkers a wide variety of choices. What is that Coffee Shot Taste? Which Bean Flavour Do You Like? The actual coffee bean changes to a different colour and also a different flavour depending on how long it is roasted for. If you would like to find out how beans are actually roasted then click here to find out about the roasting process. The important thing that I want to cover in this article though is which roast beans make the best coffee? The answer is it truly depends on your own taste buds and the flavours you like or dislike. Now personally I like my coffee strong and just a tad on the bitter side. Many of my friends like theirs to be a mild taste, and a few coffee die hard friends of mine like it to blow their heads off. In other words we all like different tastes and flavours. The basis of all coffee drinks is the actual espresso that is used to make them. It doesn't matter if you prefer an Americano to a latte, they are both made from the shot of espresso. It is that which produces the overall taste of your coffee. Sure you can add sugar, milk, cream and flavours to it, but the core product is your espresso shot. When you walk into any good coffee shop and order a coffee, then this is what happens. The person making the coffee will take some roasted coffee beans and grind them. Then in the coffee machine water is forced through those beans under pressure and you end up with an espresso shot. Somewhere like Starbucks will use a different roasted bean than Costa Coffee. Independent coffee shops may use different beans again and so the bean can vary. They may also use different types of roast from a very light mild roast to a dark roast. So hopefully you understand that both the bean used and the roast used are what determines the core flavour and taste of your coffee. ​Below I have given you an indication of roast to coffee taste. The length of time the beans spent in roasting is what you see on the labels on the outside of the bag or can of coffee that you purchase - the light, the medium, the medium dark and the dark. If you don’t like strong, bitter coffee, you want to go with a lighter roast. The lighter the roast of the coffee, the less bitterness the coffee flavour has. In a light roast, because the process isn’t as long, the oils are not freed to the outer part of the bean. This is why a light roast doesn’t taste as bitter when you drink it. With a medium roast, you’ll get a darker colour and more of a strong taste. You still won’t have as much of the bitterness - because there’s not a lot of the oil to give it that bitter taste. With a medium dark roast, the first thing that will catch your attention will be the colour of the beans. This color will be noticeably darker than the light roast and slightly darker than the medium one. When this type of roast is made, there’s a distinct bitterness to the flavour. Coffee beans that are dark roasted no longer look brown. Because these were in the roasting process the longest, they have a black color. The oil on the bean is more noticeable right away. The taste of this coffee is very bitter. If you’ve ever had an espresso, it was probably made using these darker, bitter beans. Some people get quite brave, and want to roast their own beans at home. It is not as hard as you may think. One word of warning though, timing is everything. I have a full article you can read on how to roast your own coffee beans at home. Most people discover this by a process of trial and error. Some people like their coffee strong and others like it mild. You just have to figure that out by trying different beans and different roasts. 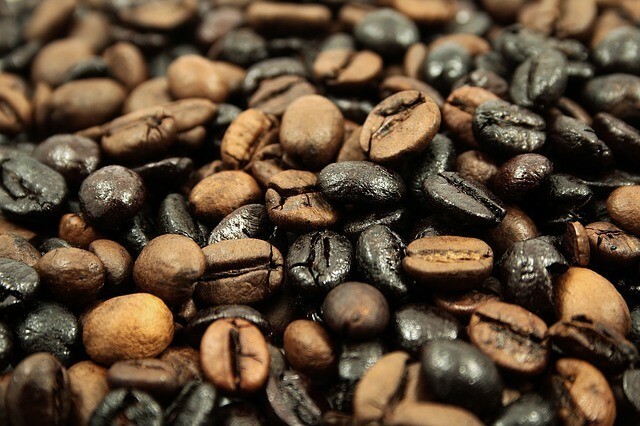 ​The type of coffee bean that you prefer to drink is going to depend on the type of roast it is. If you don’t like bitter coffee, you’re not going to be a fan of the darker roasts. If you like your coffee smoother, with not much after taste, you need to choose the light roast. ​If you like the taste of coffee and you’re not looking for something that’s going to pack a strong taste kick, then you want to take the medium or medium dark roasted beans. ​Because beans can vary even within their classifications, what one medium coffee tastes like doesn’t mean that another medium will taste exactly like it. So you may have to try several different varieties of coffee within one grouping to figure out what pleases your taste buds the most. Now if you like to drink coffee that has a powerful taste and gives you that bitter flavor, then you want to go with the darkest roast. Don’t be surprised by the appearance if you buy them whole. Sometimes, these beans can even look as if they were burned. That’s what all that oil release in the bean and the time in the roasting process will do to this roast of bean. Choosing the roast that you like is also going to depend on what else you plan to put in the cup with your coffee. If you plan to drink your coffee straight with no additives and you know you don’t like bitter coffee, stick with the lightest roast that you can find. In Europe many countries simply drink espresso and they made add a little sugar to that. In the UK however, people tend not to drink a small espresso and prefer to add water to it and have an Americano. Others like to add milk or cream and come up with lattes or cappuccinos. There are many different things that can be added to coffee such as chocolate, caramel etc. ​Coffee beans are always a choice that depends on your individual tastes, but you should know that whatever means you use to grind or make that coffee can affect the taste of the roast as well. If you’re someone that likes to brew a cup of coffee and not give it a lot of thought, then you may not be looking for a machine that’s going to turn cartwheels when it makes coffee. You may want something simple where you can press a button and the coffee gets made. But what happens sometimes is that people end up buying a coffeemaker or grinder that’s fairly simple and then they develop a better palate for their coffee flavours and wish they would have purchased one instead with more bells and whistles. ​So keep in mind that even the top of the line coffee makers that have a lot of different features and can make elaborate coffee can also make you a simple cup of coffee. That way, when you want more options, and better flavor, you have it. Regardless of what roast type or flavour you want, make sure you measure out your coffee before you put it into the machine. Don’t eyeball it. You need precise measurements to brew the best cups of coffee, consistently. When it comes to picking beans to roast always have in the back of your mind the end flavour that you prefer. The majority of people will prefer either a light roast or a medium roast. Only coffee junkies like the really dark roasts.